1" copper monogrammed earrings with fresh water pearl accents. 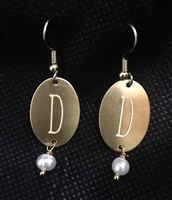 Stainless Steel ear wires Brass monogrammed earrings with fresh water pearl accents. Stainless Steel ear wires These beautiful freshwater pearl earrings on sterling silver ear hooks look just like dew on a summer morning! These beautiful earrings are a wonderful reminder of your faith! Earrings are sterling silver and 1.25" long A great reminder of your faith! The beautiful Mississippi Moonbeam Earrings are freshwater pearls on a sterling silver post. Sterling Silver Cubic Zirconia Personalized Monogram Earrings. 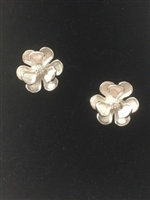 The beautiful sterling silver magnolia Earrings are perfect accent to any wardrobe. The beautiful Mississippi Blackberry Earrings are a cluster of lustrous fresh water pearls suspended from sterling silver ear wires. 2 ct. t.w. of blue topaz suspended from 1.5'' diamond shaped hoops. © Copyright 2016 www.jewelrybyrandy.com. All Rights Reserved. Built with Volusion.